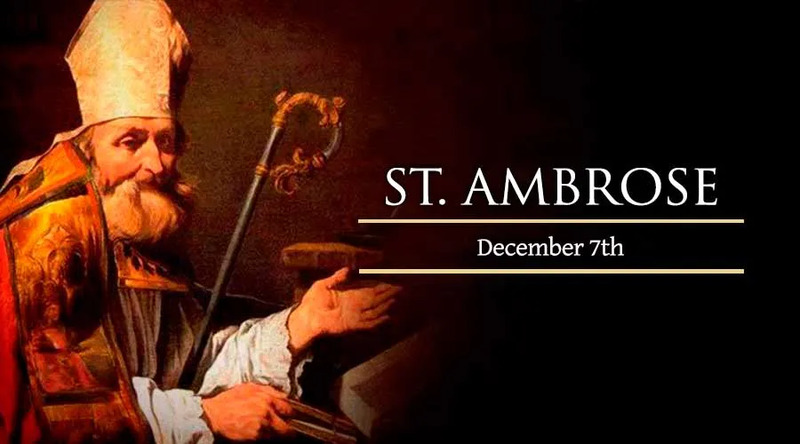 Today the Catholic Church celebrates the memory of St. Ambrose, the brilliant Bishop of Milan who influenced St. Augustine's conversion and was named a Doctor of the Church. Like Augustine himself, the older Ambrose (born around 340) was a highly educated man who sought to harmonize Greek and Roman intellectual culture with the Catholic faith. Trained as a lawyer, he eventually became the governor of Milan. He manifested his intellectual gifts in defense of Christian doctrine even before his baptism. While Ambrose was serving as the governor of Milan, a bishop named Auxentius was leading the diocese. Although he was an excellent public speaker with a forceful personality, Auxentius also followed the heresy of Arius, which denied the divinity of Christ. Although the Council of Nicaea had reasserted the traditional teaching on Jesus' deity, many educated members of the Church – including, at one time, a majority of the world's bishops – looked to Arianism as a more sophisticated and cosmopolitan version of Christianity. Bishop Auxentius became notorious for forcing clergy throughout the region to accept Arian creeds. At the time of Auxentius' death, Ambrose had not yet even been baptized. But his deep understanding and love of the traditional faith were already clear to the faithful of Milan. They considered him the most logical choice to succeed Auxentius, even though he was still just a catechumen. With the help of Emperor Valentinan, who ruled the Western Roman Empire at the time, a mob of Milanese Catholics virtually forced Ambrose to become their bishop against his own will. Eight days after his baptism, Ambrose received episcopal consecration on Dec. 7, 374. The date would eventually become his liturgical feast. Bishop Ambrose did not disappoint those who had clamored for his appointment and consecration. He began his ministry by giving everything he owned to the poor and to the Church. He looked to the writings of Greek theologians like St. Basil for help in explaining the Church's traditional teachings to the people during times of doctrinal confusion. Like the fathers of the Eastern Church, Ambrose drew from the intellectual reserves of pre-Christian philosophy and literature to make the faith more comprehensible to his hearers. This harmony of faith with other sources of knowledge served to attract, among others, the young professor Aurelius Augustinus – a man Ambrose taught and baptized, whom history knows as St. Augustine of Hippo. Ambrose himself lived simply, wrote prolifically, and celebrated Mass each day. He found time to counsel an amazing range of public officials, pagan inquirers, confused Catholics and penitent sinners. The people of Milan never regretted their insistence that the reluctant civil servant should lead the local church. His popularity, in fact, served to keep at bay those who would have preferred to force him from the diocese, including the Western Empress Justina and a group of her advisers, who sought to rid the West of adherence to the Nicene Creed. Ambrose heroically refused her attempts to impose heretical bishops in Italy, along with her efforts to seize churches in the name of Arianism. Ambrose also displayed remarkable courage when he publicly denied communion to the Emperor Theodosius, who had ordered the massacre of 7,000 citizens in Thessalonica. The chastened emperor took Ambrose's rebuke to heart, publicly repenting of the massacre and doing penance for the murders. “Nor was there afterwards a day on which he did not grieve for his mistake,” Ambrose himself noted when he spoke at the emperor's funeral. The rebuke spurred a profound change in Emperor Theodosius. He reconciled himself with the Church and the bishop, who attended to the emperor on his deathbed. St. Ambrose died in 397. His 23 years of diligent service had turned a deeply troubled diocese into an exemplary outpost for the faith. His writings remained an important point of reference for the Church, well into the medieval era and beyond.